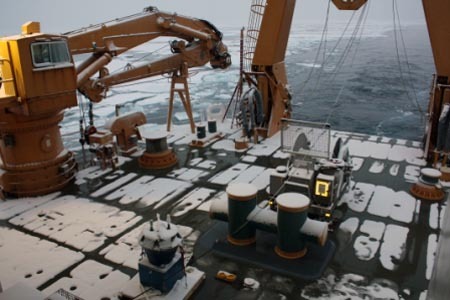 Our team of scientists from the University of New Hampshire and NOAA, along with colleagues from the Navy, USGS, and other organizations, are underway in the Arctic Ocean aboard the U.S. Coast Guard icebreaker HEALY for a seafloor mapping expedition to help the United States define the limits of its continental shelf beyond 200 nautical miles. Capt. 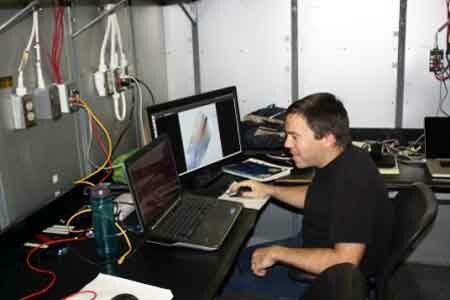 Andy Armstrong of the NOAA/UNH Joint Hydrographic Center is one of the chief scientists aboard the Healy. He is sending these notes from the top of the world. Final entry for the project. We arrived in Dutch Harbor on Unalaska Island in the Aleutian Island chain today. The weather was windy, and rainy with low clouds. The temperature was 41° F. Dutch Harbor is a container port and is the United States' number 1 port for fisheries landings. Shortly after passing through the Bering Strait in clear and calm weather, we encountered stormy weather and high seas. 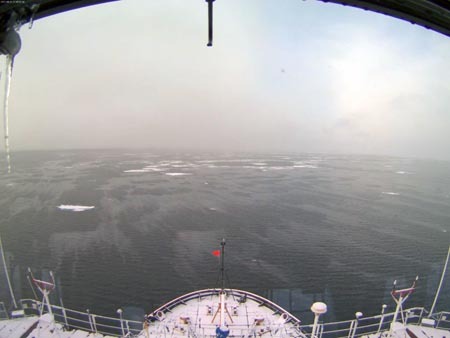 The winds have been blowing at 30 to 40 knots and the seas have been 12 to 14 feet for most of our transit across the Bering Sea. The seas have been on our stern, and Healy is a big ship, so despite the rough seas, we have experienced a very comfortable ride. High seas across the Bering Sea. 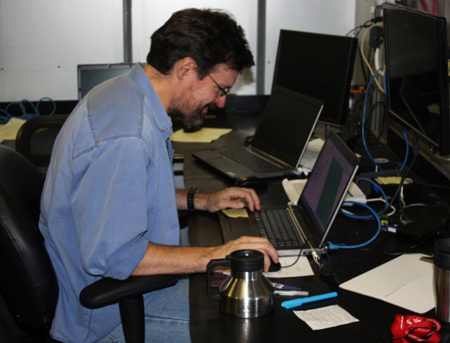 Dr. Brian Calder from UNH is the project lead for data processing and data management. He has been busy, with help from UNH graduate student Giuseppe Masetti, for the last few days organizing and backing up data. 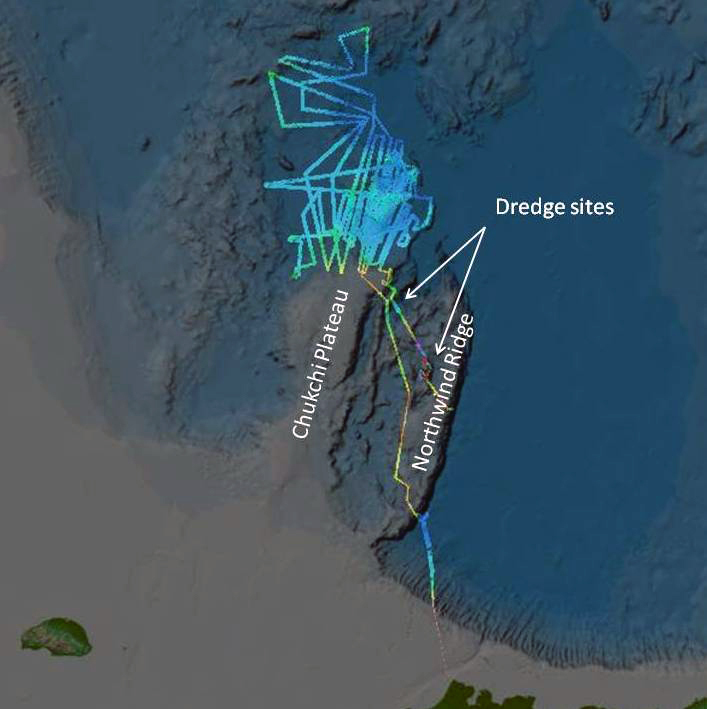 Our data has been acquired at significant expense and is very important to the United States’ Extended Continental Shelf project, so careful data management is essential. We have created multiple copies of all our data, and several different members of the science party will be carrying copies back to UNH to ensure that lost baggage or damage does not result in lost data. Brian Calder backing up data. Giuseppe Masetti at his workstation. 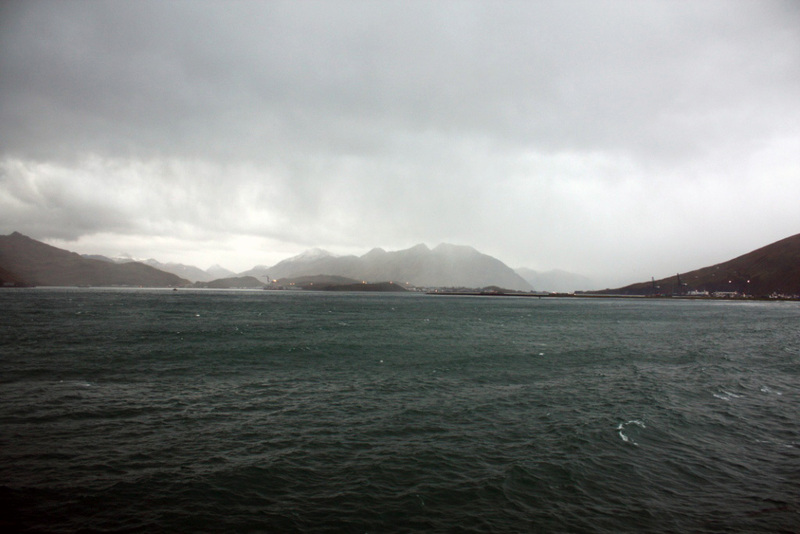 During the course of our cruise, we steamed 6471 nautical miles including our transit to Dutch Harbor. Our ECS project accounted for 5416 of those miles. With an average multibeam swath width of 2.5 times the water depth, we mapped approximately 20,000 square nautical miles of the seafloor. We dropped 71 XBTs (expendable bathythermograph), 18 XCTD (expendable conductivity, temperature, depth) probes, took 4 CTDs with water samples, deployed 9 buoys and profilers and drifters, and successfully completed 5 seafloor dredges. All in all, it has been a very productive cruise. Special thanks to Colleen Mitchell who has been setting up, managing, and posting the journal at UNH! While we have been steaming towards Dutch Harbor, we have been busy completing the final data processing and organizing the data for additional analysis ashore. One of our activities has been the creation of Geographic Information System (GIS) products for our analysis work and for sharing our results with the public. 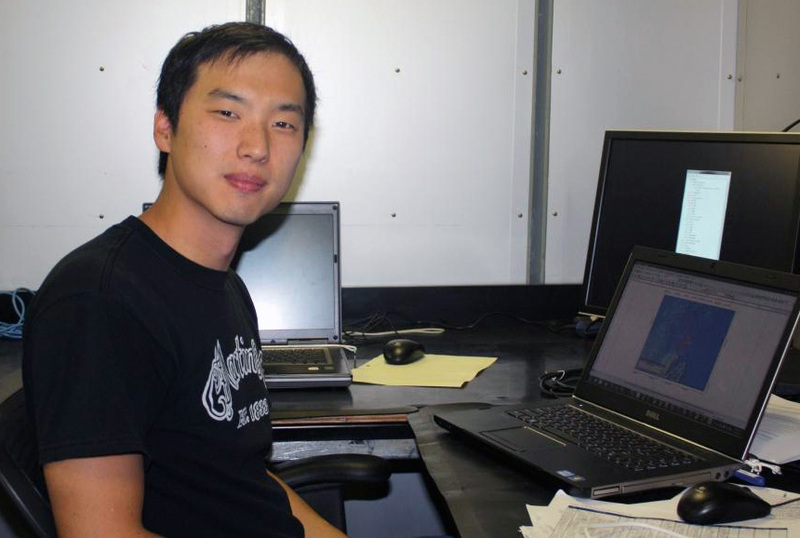 Elliot Lim is a GIS specialist from NOAA’s National Geophysical Data Center, and has been our onboard expert for creating the GIS products of the cruise. Elliot Lim compiling final GIS products. GIS-produced map of the cruise track. On September 24 we passed through the Bering Strait in beautiful calm and clear weather. 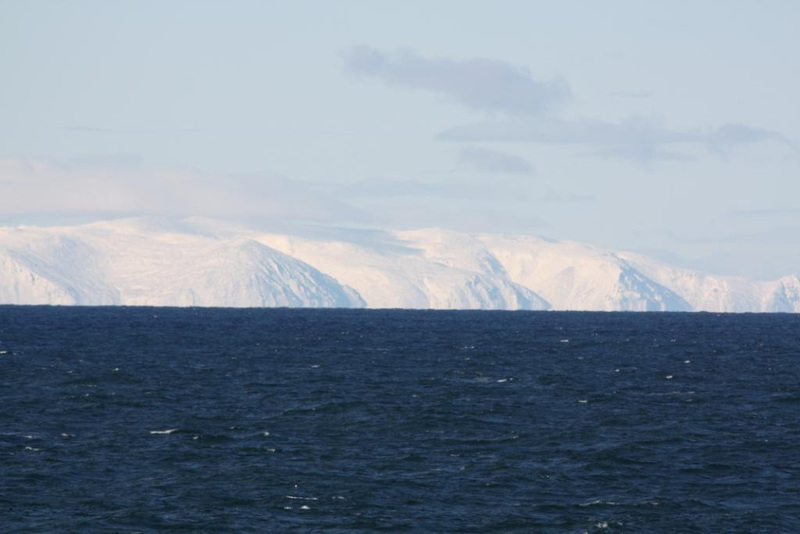 We could see Cape Dezhneva in Russia on our starboard side and Cape Prince of Wales in Alaska on our port side. 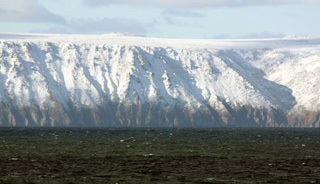 Cape Dezhneva was completely snow-covered from the highest elevation all way the down to the sea. 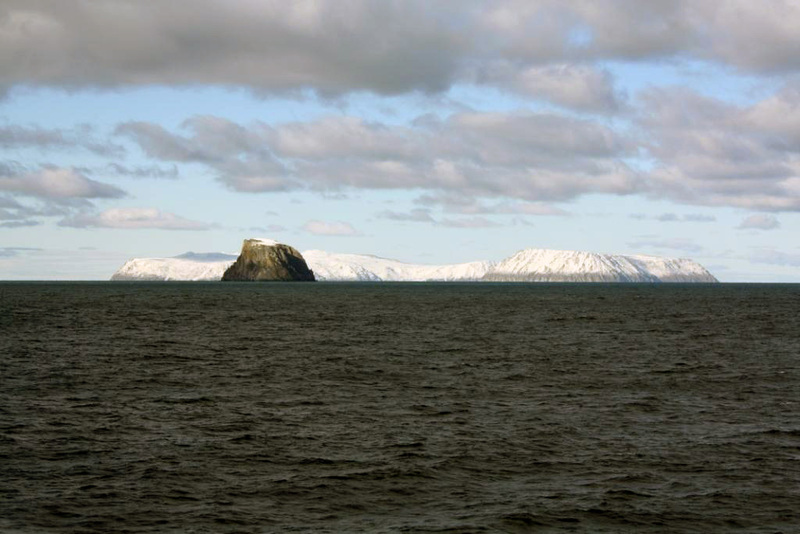 A little while later, we passed by Big Diomede Island, Little Diomede Island, and Fairway Rock. 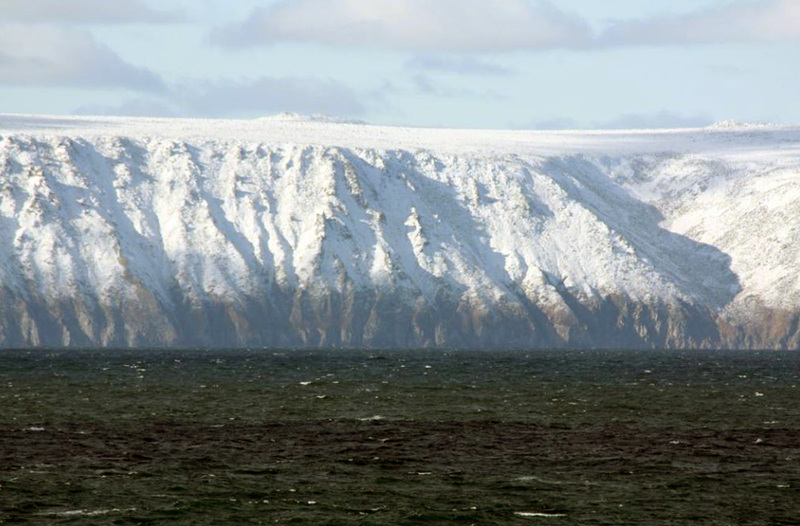 Big Diomede is part of Russia; Little Diomede and Fairway Rock are part of the United States. 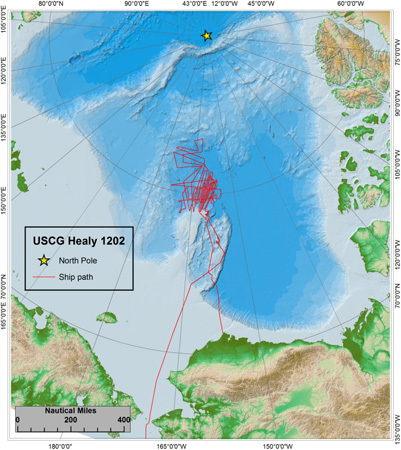 Healy’s track line through the Bering Strait. 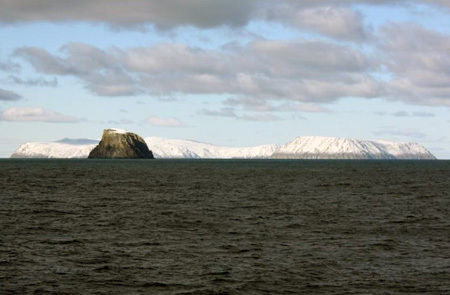 Fairway Rock, Big Diomede (left) and Little Diomede (right) Islands. 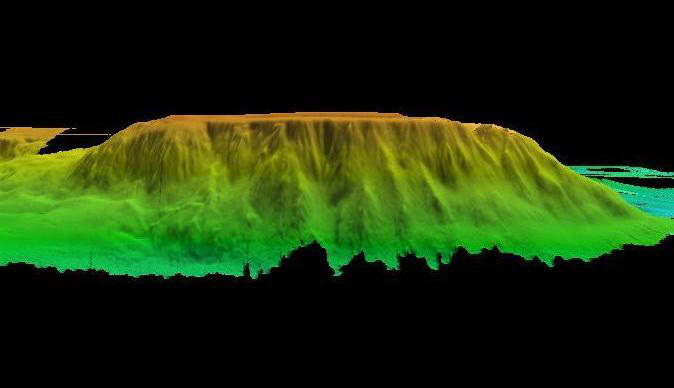 An enormous advantage of multibeam echo sounders over the single beam echo sounders of the past—particularly for scientific mapping—is the ability to see the details in the shape of the seafloor. I was struck by the similarity in shape and structure between these islands and some of the undersea features we have mapped in the course of our Arctic Ocean project. Comparing the multibeam images with the photographs, we can see that the top, the abrupt slope, and the erosional patterns are similar even though the islands are above the sea surface, and the features are as much as 3800 meters below the sea surface. Little Diomede and Chukchi undersea feature for comparison. On Saturday morning we completed our final, and most successful, dredge of the cruise. 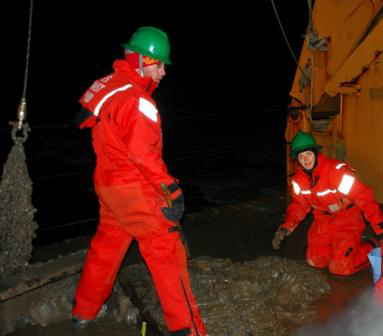 Our target for this dredge was a small and steep bump 3000 meters deep on the eastern flank of the Northwind Ridge. The Healy’s conning officers and our “dredge master,” Dale Chayes, placed the dredge exactly on the target and pulled it precisely up the 40-degree slope. 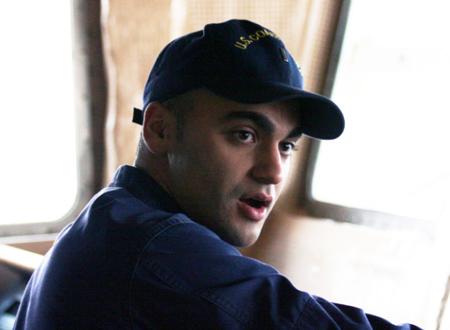 Healy conning officer, Lt.( j.g.) Kris Valdez. The Northwind Ridge plunges abruptly from a flat-topped plateau at 600 m depth to the seafloor of the Canada Basin at 3800 m depth. This remarkable geologic structure runs continuously for 400 nautical miles along a generally northward trend from the Alaska coastal margin. The dredge brought back several hundred pounds of rock and mud including a large amount of metamorphic rock that had unquestionably been broken off from the slope. The sides of the rocks that were exposed to the sea were covered with thick manganese crust, but the broken sides were fresh and angular. We want to use these rocks to help describe and understand the geology and geological history of the this part of the Arctic, so it is important that the rock we recover is from the local seafloor as opposed to rock that was picked up and carried from shore by ice and dropped when the ice melted. Chief Scientist Larry Mayer (with rock), Kelley Brumley (left) and Bernie Coakley looking at the dredge haul as our dredge recovery team rinses and collects the samples. Freshly broken-off rock from the dredge showing outer manganese crust. 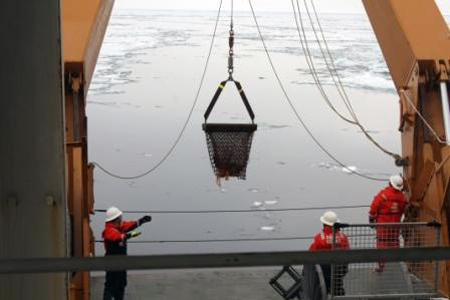 After we got the dredge onboard, we deployed the “Ice Goat,” a meteorological and ocean observation buoy built and monitored by the U.S. Naval Academy. See their Facebook page. In addition to meteorological and oceanographic instruments, the Ice Goat has solar panels that power cameras. When there is sufficient sunlight, the buoy transmits photos ashore every 2 hours. You can see what the Ice Goat is seeing at icegoat.datatransport.org/monitor#icegoat-1/camera0 and icegoat.datatransport.org/monitor#icegoat-1/camera1. When the buoy was safely launched, Healy turned to the southwest and began the transit to Dutch Harbor. The ship brought an additional engine online and increased from our mapping speed of 12 knots to a transit speed of 15 knots. On Sunday, we passed out of our project area and began the process of organizing and copying our data and packing up the rocks for shipment home. We have had a very successful cruise, acquiring valuable multibeam bathymetry, subbottom profiles, seafloor dredge samples, gravity measurements, and ocean water and ice samples. 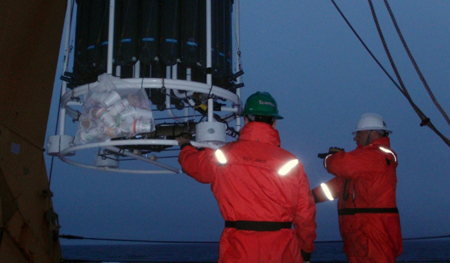 We’ve also deployed several meteorological and oceanographic buoys and an ocean profiler. We monitor the dredge with a tension meter on the winch that lowers and recovers the dredge basket to/from the seafloor. We record the tension on the wire before the dredge touches the seafloor. This tells us the combined tension due to the weight of the wire and empty basket. When the dredge lands on the seafloor, the weight of the basket is no longer on the wire and the tension drops. As we retrieve the dredge with the winch, we hope the dredge catches on and breaks off outcropping seafloor rock and captures broken-off pieces. When the dredge catches rock on the seafloor, the additional strain is reflected on the tension meter. If we see a large and abrupt increase in tension followed by sharp drop in tension, it suggests we may have snagged some rock and broken it loose. We saw this pattern of tension changes this morning, but during the recovery we also saw a long period of increasing tension without the sudden drop. This was a sign that the dredge was lodged on the seafloor. 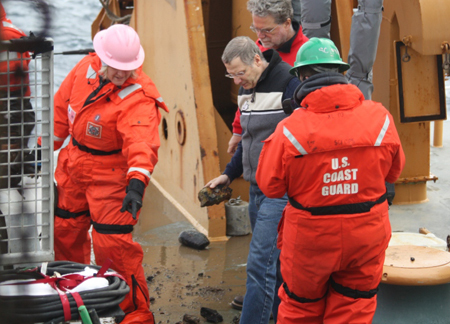 Eventually, with the help of some expert ship maneuvering by Healy’s conning officer, the dredge was freed, and returned to the surface with a nice sample of rocks. USCG Boatswain Juan Rivera-Montserrate and team recovering dredge sample from the dredge basket. 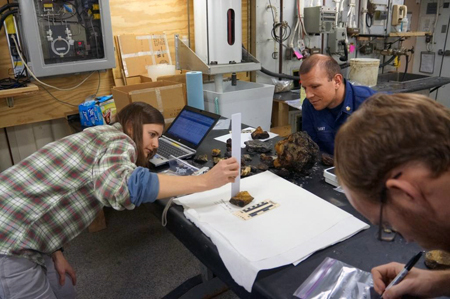 Our curators spent much of the day cleaning, separating, measuring, photographing, and cataloging the dredge samples. This effort is critical in establishing a good record of our sampling so that these rocks can maintain their scientific value and relevance for the long term. 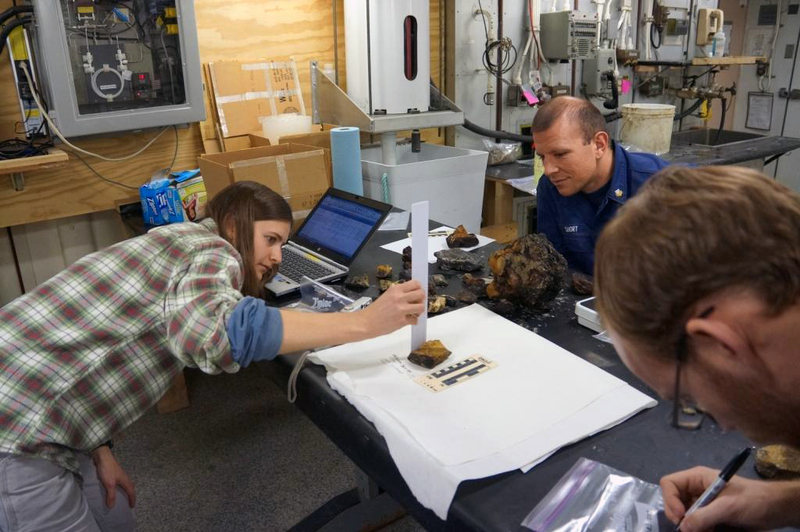 Kate McMullen (USGS), Sammy Short (USCG) and Evan McQuinn (NOAA) cataloging the samples. Photo by John Farrell. 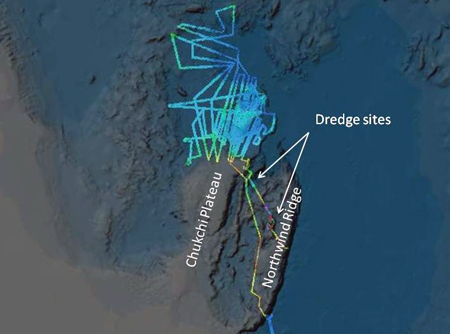 The day ended with another successful dredge farther south on the Northwind Ridge portion of the Chukchi Plateau region. Tomorrow will also begin with a dredge. We have spent Wednesday and Thursday filling in some of the remaining gaps in mapping coverage on the northern slope of the Chukchi Plateau. 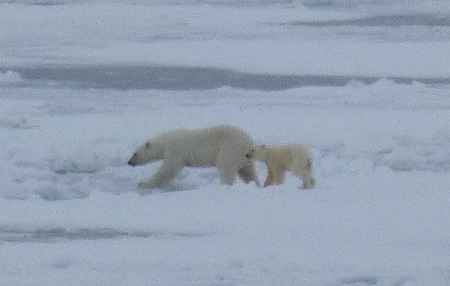 On Wednesday, we saw a polar bear mother and cub. 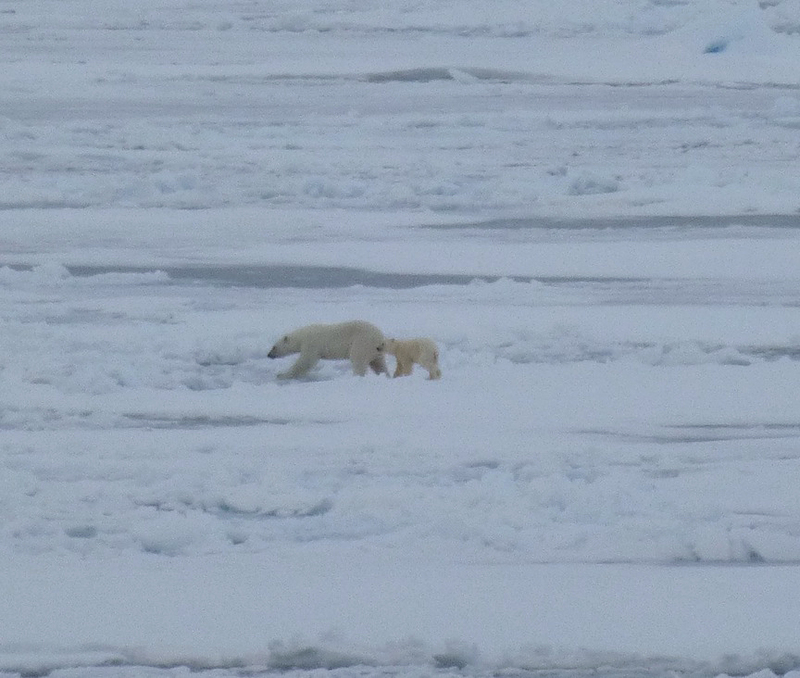 They were probably the last polar bears we will see this year. Wednesday ended with a beautiful sunset over the almost complete (9/10 to 10/10) ice cover. Polar bear mother and cub. Photo by Lindsay McKenna. As we fill in the mapping, we are working toward the south where we have two more dredge sites selected. Today (Thursday), we completed the area where the channel we have been mapping (see September 15–16) seems to spread out and end. The National Snow and Ice Center reported that the summer ice minimum was reached on September 16 this year, and that 2012 officially set the record for the lowest summer ice minimum ever, eclipsing the previous record from 2007 by a significant margin. The net switch from melting to re-freezing on the 16th corresponds with our observations. 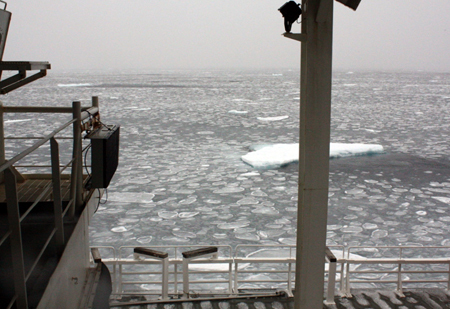 Today, as we were traveling south and leaving the ice, we passed through a large band of newly forming ice. One of the characteristic stages of newly forming ice is called “pancake” ice, where the developing sea ice forms in round plates resembling pancakes. We saw quite a bit of pancake ice today. Healy passing through pancake ice. Overnight, we completed our second dredge. When the dredge came aboard, the basket was full of mud again, but this time there were more rocks mixed in. The rocks were more substantial than those of the first dredge and included rocks with freshly broken surfaces—convincing evidence that these rocks were from outcropping rock. The rocks appear to be basalt, an igneous rock that can be found both on the continents and in the ocean. 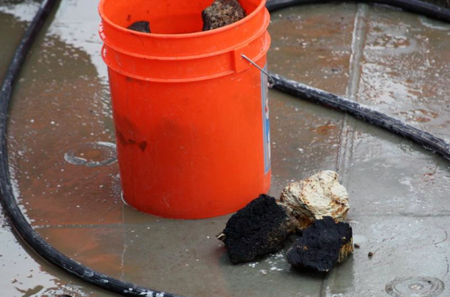 We can’t say much more about these rocks without doing some detailed analysis in a laboratory ashore. 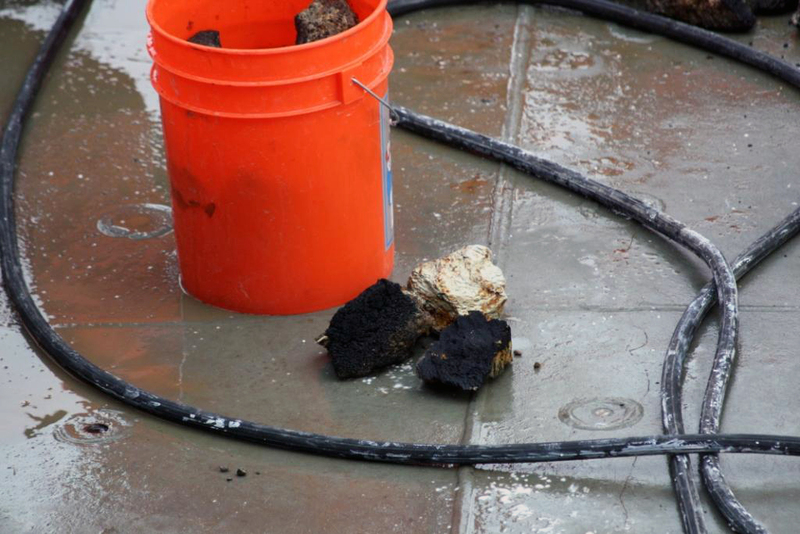 The dredge also contained some thick manganese crusts that form on the seafloor in oceans throughout the world. NOAA scientist Evan McQuinn and USGS scientist Kate McMullen recovering rock samples from the dredge haul. Photo by Bogdan Onac. During the day today, we tried to do some more mapping to fill in gaps our coverage of the seafloor. We found the conditions very difficult, however. Winter is returning to the Arctic. Areas that were in the marginal ice zone or ice free just a week ago are now covered with new ice. 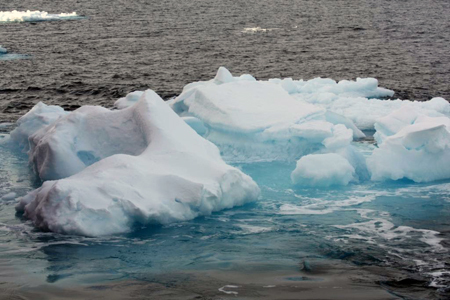 In many areas the new ice surrounds floes of old, multiyear ice. We have found that, surprisingly, the new ice is the most difficult to map in. New sea ice is fairly flexible, and it seems to be flowing under the keel (and therefore under our echo sounder transducer) rather than breaking and floating by on the surface as we pass through it. After spending a few hours trying to acquire multibeam data in these conditions we broke off and headed back toward our 1st dredge site for another try. Unfortunately, the wind and the moving ice created conditions that precluded the dredge. We left the dredge site and resumed mapping. The newly forming ice had thickened up enough in the 6 hours since we broke off that we were able to collect good depth data. Early this morning, the dredging operation we began last night was completed and the dredge brought aboard. The basket was mostly full of mud—not what we wanted—but also contained a dozen or so rocks that we think are from the rock outcropping at the site. There were not any freshly broken edges that would confirm they were broken off by the dredge, and hence of local origin, but these rocks were soft and friable, which suggests to us that they could not have traveled far to reach this location. Dale Chayes and Kelley Brumley setting up to monitor the dredging operation. During the day, we mapped some unsurveyed areas along an indirect path to our next dredge site. This mapping time allowed our dredging team from the Healy crew and the science party to get some rest. While filling in a small, previously unmapped spot along our path, we found a steep bluff on the seafloor, providing us with an additional and totally unexpected potential dredge site. We will consider that site for later in the cruise. In the evening, we arrived at our second dredge site and deployed the dredge. The weather forecast called for significantly increasing winds through the night, but fortunately the winds did not actually increase enough to interfere with dredging. 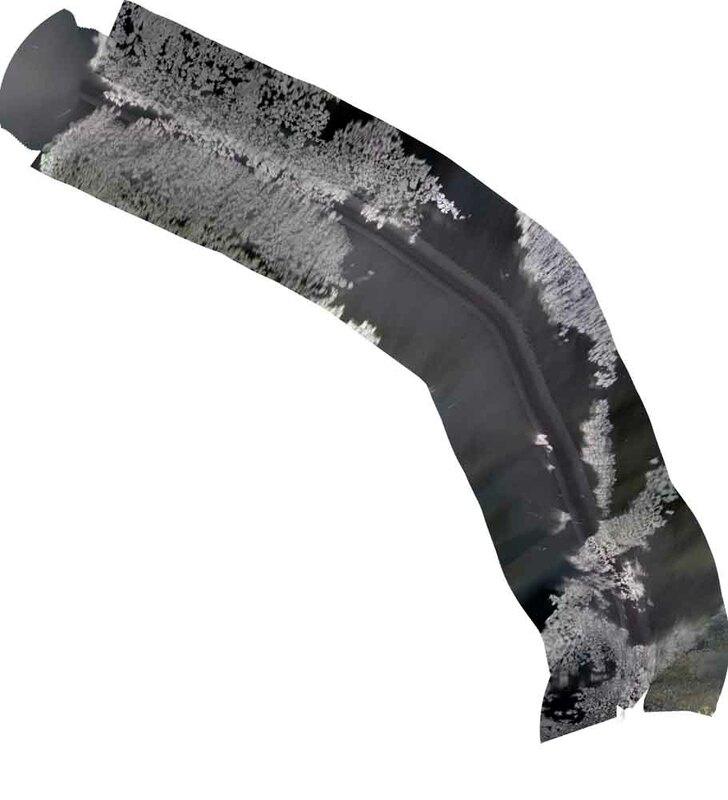 3-D image of the seafloor at the dredge site. 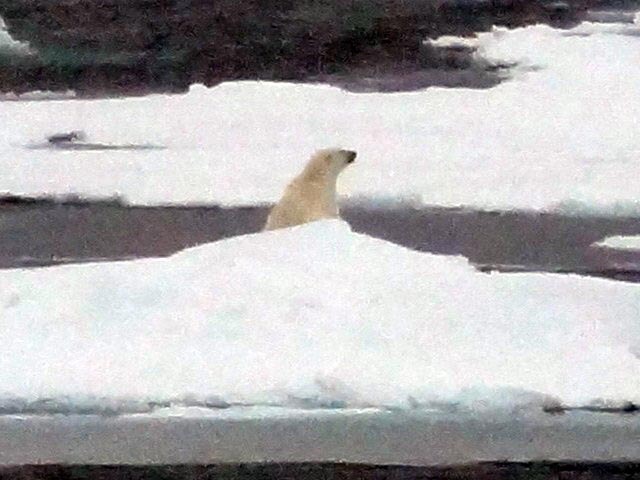 A polar bear came by the ship to investigate while we were dredging. The bear spent a good bit of time nearby, and came fairly close. Polar bear watching the dredging. Saturday was a pretty eventful day. The day began with King Neptune’s court and Davey Jones greeting the first-time visitors to the Arctic Ocean and initiating them as “polar bears.” Shortly after the ceremony was over, a real polar bear was seen not too far off and we were able to get some pictures. 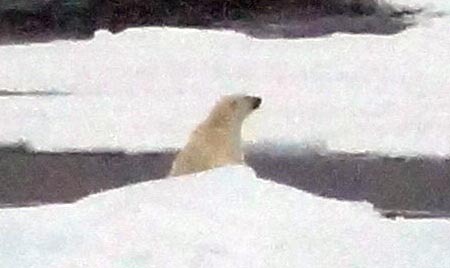 Later in the day, a second polar bear was sighted close enough for more photos. Polar Bear. Photos by John Farrell. 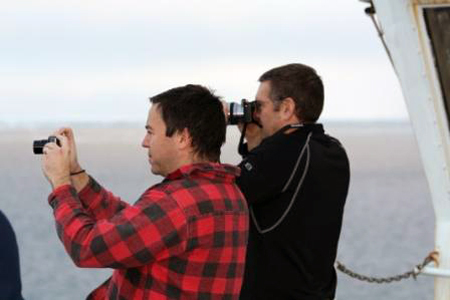 Roland Arsenault and John Farrell taking polar bear photos. The wind and seas that thwarted our dredging on Thursday died down on Friday night, and the temperature dropped a couple degrees to about 26° F overnight and on Saturday. The result was newly freezing sea. Relatively large areas at the northern end of our zigzag lines were freezing over with new ice. Snow came along with the colder temperatures coated the new ice. 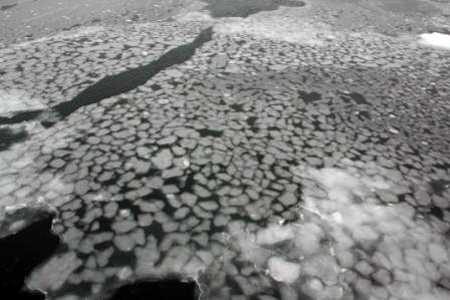 New ice forming over open water between floes. Our multibeam data this year has revealed an impressive channel system crossing the northern slope of the Chukchi Plateau. We have been able to map most of the channel as we cross back and forth with our swaths. The structure of the channel will help geologists understand the mechanisms of sediment transport off the Plateau into the ocean basin, and is another example of the geologically significant features we have found in the course of our mapping for the extended continental shelf. Seafloor channel crossing the northern end of Chukchi Plateau. At midday on Sunday we began preparations for another dredging attempt. Scientific seafloor dredging is not the same thing as the dredging done in ports and harbors to deepen or maintain shipping channels. 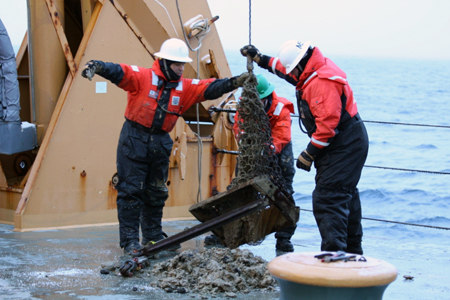 Our dredging involves lowering a heavy steel basket to the seabed to collect representative samples of seafloor rocks. To avoid collecting only the mud and bits of ice-rafted material that has settled to the seafloor relatively recently (in geological time scale), we look for an area with a slope of 30° or more. 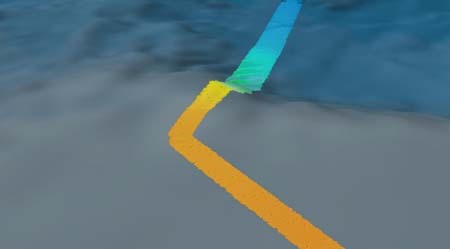 Most slopes on the seafloor are on the order of 1° - 2° or less, so areas with 30° slopes are very steep and very uncommon. On these steep slopes, we are more likely to encounter and recover outcropping rock representing the underlying structure of the seabed. Using our multibeam bathymetry data, UNH Chief Scientist Dr. Larry Mayer and Stanford University graduate student Kelley Brumley selected a steeply sloping area for our dredging attempt. We then ran some additional multibeam lines over the area to improve our map detail and identify a precise dredge location. 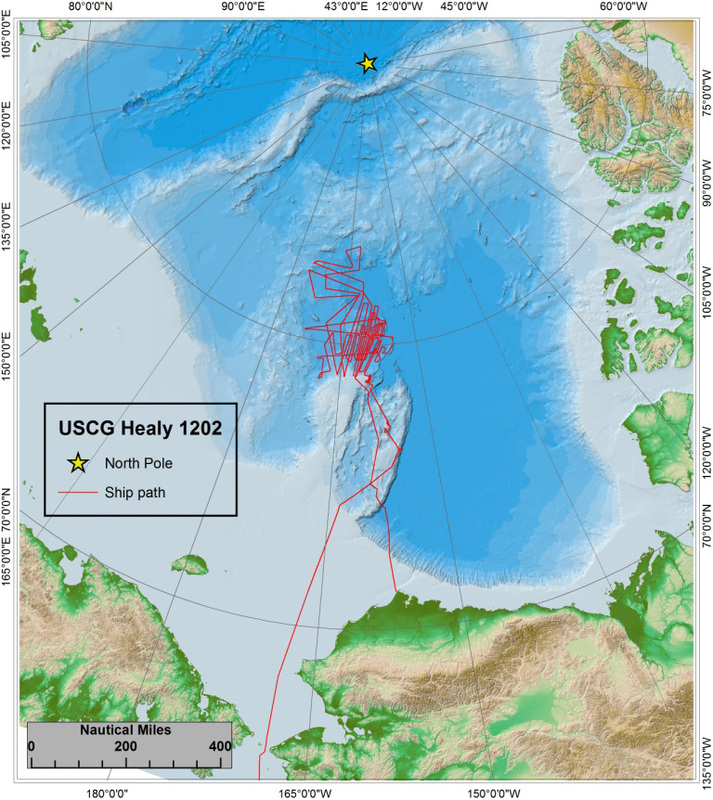 Having selected our target location, Healy was maneuvered into position, and the dredge was lowered toward the seafloor at about 9:00 pm local time. The dredge was still down as the day ended. 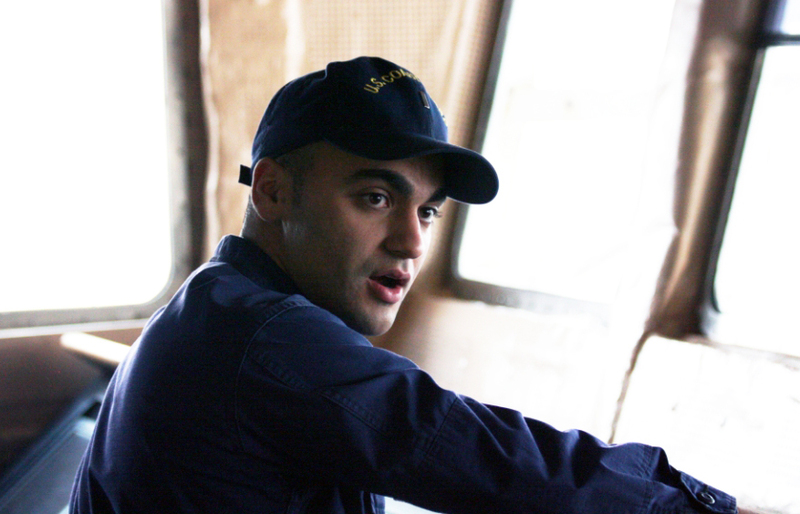 Coast Guard Chief Boatswain Mate Troy Shrum guiding the dredge over the stern. On Thursday morning, we planned to break off our multibeam mapping to dredge the seafloor for rock samples on a mesa-like feature at the western end of our project area. Unfortunately, the 30-knot winds from the north created sea conditions unsuitable for dredging. Although the lack of ice is making our mapping easier, dredging is one activity that would have been easier in the ice pack. 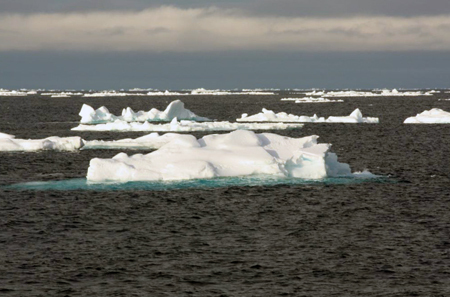 Had our target site been farther north, the ice pack might have dampened the waves enough to permit the operation. We continued our seafloor mapping working eastward with a set of north-south zig-zag lines along the northern slope of the Chukchi Plateau. The multibeam swaths we have obtained on this project will make this area one of the best-mapped regions of the Arctic Ocean. On Friday morning, we stopped for what is likely our last CTD cast of the cruise. The cast, in about 3000 meters of water took just under 3 hours. As we have with the earlier two CTDs, we stopped the instrument at several points on the way up to collect water samples for the ocean acidification research. 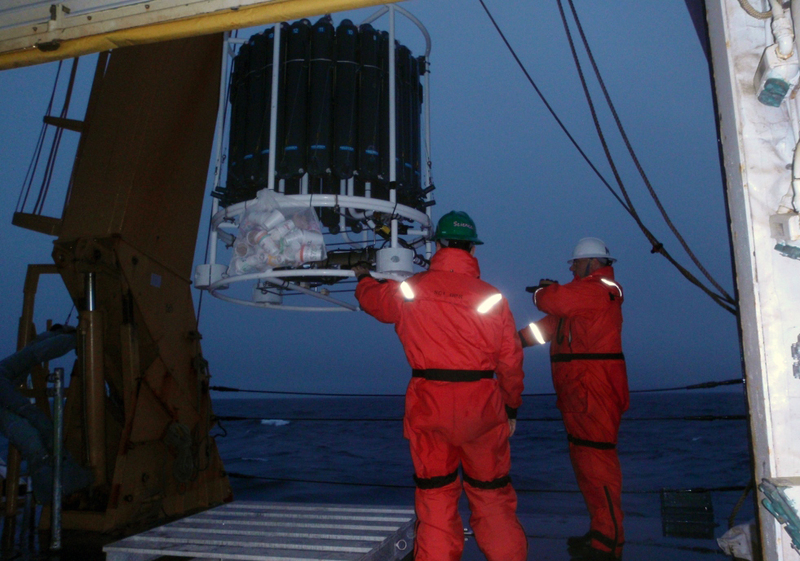 The CTD rosette is equipped with a set of “Niskin” bottles that close and trap water samples on command from the CTD control system on the ship. 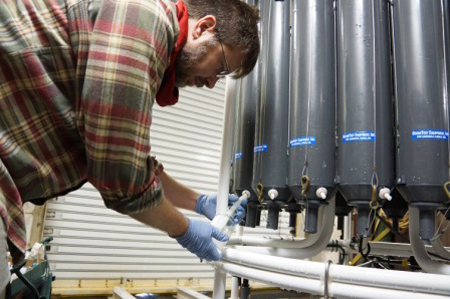 University of South Florida graduate student Paul Knorr drawing sample water from the Niskin bottles on the CTD rosette. We plan to map for another day, and then begin a series of seafloor dredges. We have continued running east-west swath profiles across the northern slope of the Chukchi Plateau. In addition to providing checks on the north-south bathymetric (depth) swaths, these lines also provide checks on our gravity measurements. Every multibeam line is also a gravity line. Healy is equipped with 2 gravity meters that are collecting data continuously during our project. Gravity meters installed on Healy. 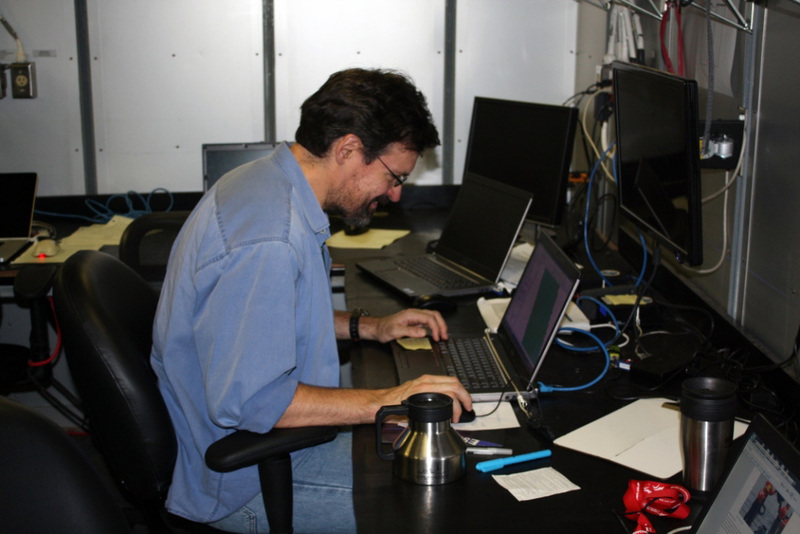 Dr. Bernard Coakley is a geophysicist from the University of Alaska, Fairbanks and is the gravity expert in our science team. 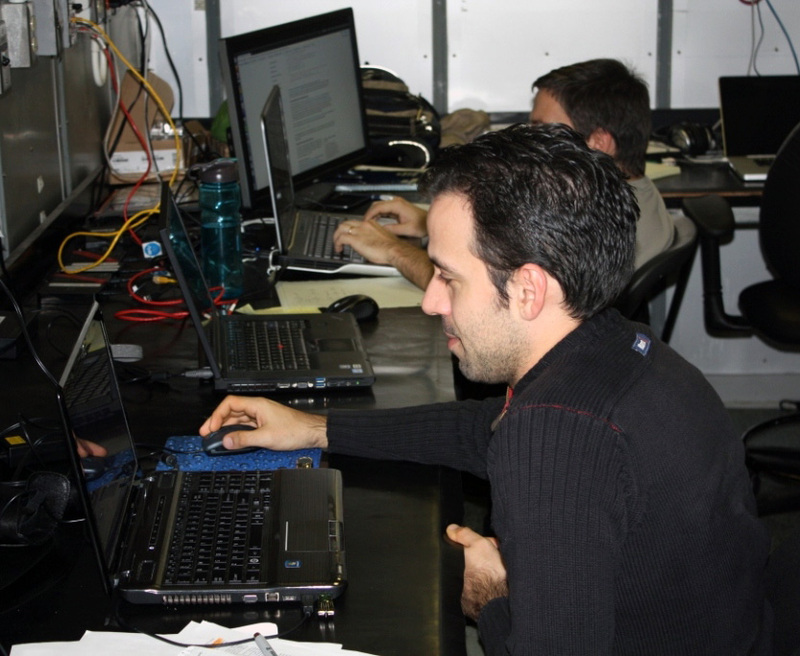 He is monitoring the gravity meters and processing the gravity data they generate. The gravity meters are sensitive instruments that measure the variation of the earth’s gravitational field as we travel along. 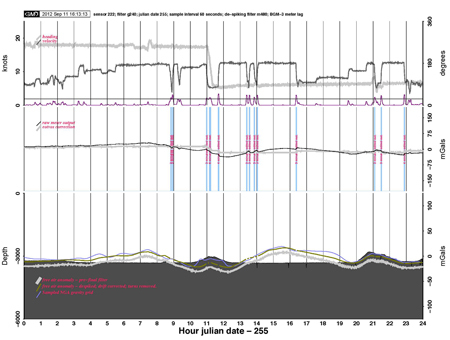 The meters also respond to the accelerations of the ship as it moves up and down with the sea and varies course and speed. These ship motion accelerations are not a result of changes in the earth, and they are removed in data processing. The remaining variation measured by the meter is the result of changes in the distribution of density of the earth’s crust resulting from variations in bathymetry and crustal thickness. 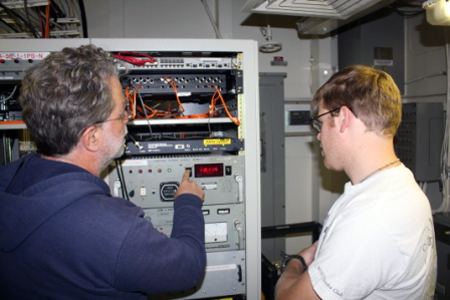 Dr. Coakley describing gravity meter control unit to UNH graduate student Chris Englert. We are measuring bathymetry with our multibeam echo sounder, so the effects of bathymetry can be removed, leaving a data set that helps us understand the regional structure and makeup of the earth’s crust. A day of processed gravity meter results. We started a new phase in our mapping plan today. We completed, for now at least, our north-south profiles on the northern slope of the Chukchi Plateau and began a line westward across the same area. This cross line will provide a set of consistency checks on our other lines—we compare the depths for the east-west line with the depths in the same location on the north-south lines and compare the depths from the center or “nadir” beams with depths from outer beams. The east-west lines will also provide profiles showing the slope down from the edge of the Mendeleev Ridge, across the Mendeleev Plain and the northern part of the Chukchi Plateau, and continuing down to the base of the slope in the Canada Basin. Mapping progress through September 10. Much of our westward line today was in the marginal ice zone on the edge of the ice pack, where new ice has been forming for the last two days. 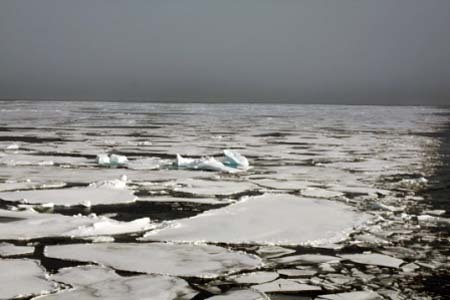 The sea between floes is covered with a thin layer of slushy ice. Roland Arsenault, a research scientist from UNH is working on a camera and image processing system to capture and produce photo-mosaics of the ice along Healy’s track. Cameras in the Aloft Con record images looking forward, to the left, and to the right. Aloft Con ice camera image. The individual images are combined into a geographically-referenced photo-mosaic. The mosaic can be superimposed on ice cover interpretation maps derived from satellite observations as a means to validate the interpretations and to provide feedback to the ice analysts at the National Ice Center. Geo-referenced mosaic of Aloft Con images. Image provided by Roland Arsenault. UNH research scientist Roland Arsenault processing images. Over the weekend we continued our survey of the northern slope of Chukchi Plateau. We have been filling in the coverage of this area with profiles from the top of the plateau to the Nautilus Basin. The northern ends of the lines have been in the marginal ice zone and the ice pack. The southern ends of these 160-nautical mile lines have been in ice-free water. A nautical mile equals 1852 meters; the length of the arc of 1 minute of latitude on the surface of the earth at the equator. On Saturday we launched an “UpTempO” oceanographic buoy. This buoy measures the barometric pressure, air temperature, and seawater temperature at the surface, and has an 80-meter cable of temperature sensors and a weighted depth sensor trailing below to measure a temperature profile through the upper part of the water column. The buoy transmits these data by satellite, and has an underwater drogue attached to ensure it moves with the ocean current rather than with the wind. 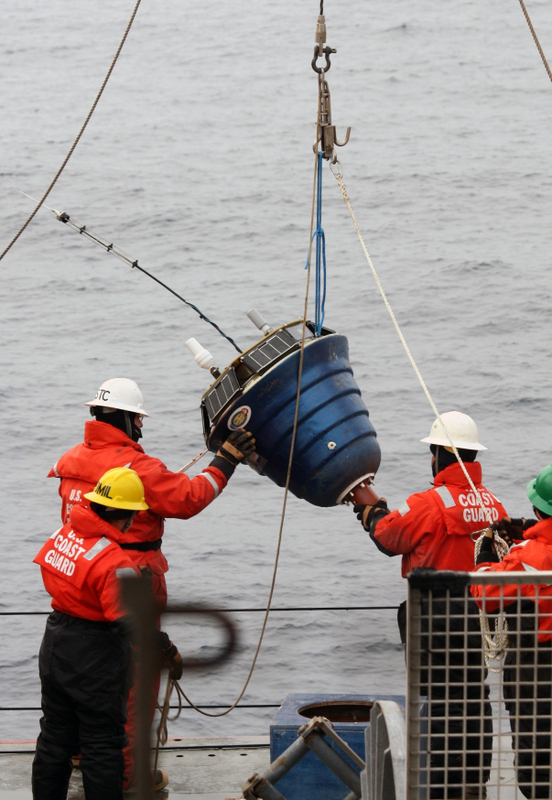 Deployment of the UpTempO oceanographic buoy by Dr. Pablo Clemente-Colon of the National Ice Center and members of Healy’s deck force. On Sunday, we began to see the ocean surface refreezing in open water patches between floes of the ice pack. 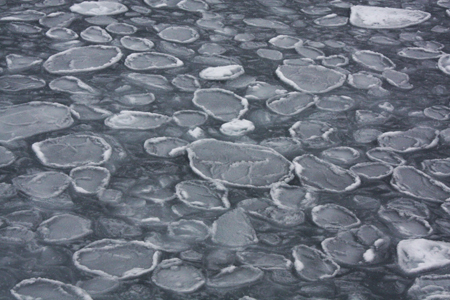 The ice forms in small, roundish plates; this kind of newly forming ice is known as pancake ice. One of the members of our science team, Matt Ayre, is a PhD student from the University of Sunderland, in the United Kingdom. 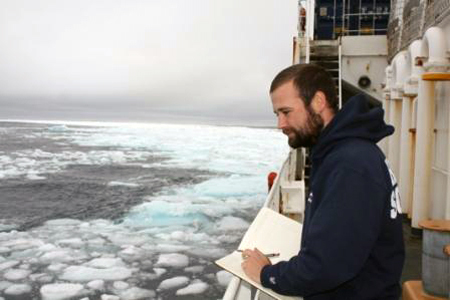 He is pursuing research in paleoclimate reconstruction by using the meteorological observations recorded in historic British whaling ship logbooks of 1750 - 1850 to help gain an insight into the past climate of the Arctic region. 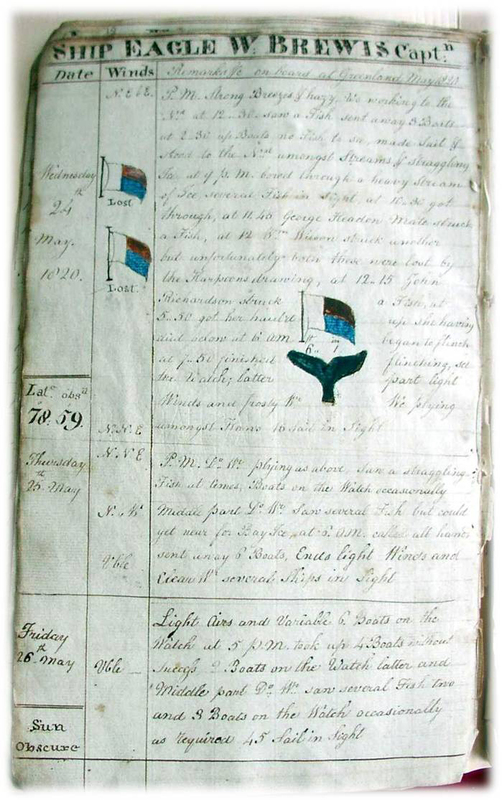 Among other observations, the logbooks contain detailed descriptions of the sea ice the whalers encountered. 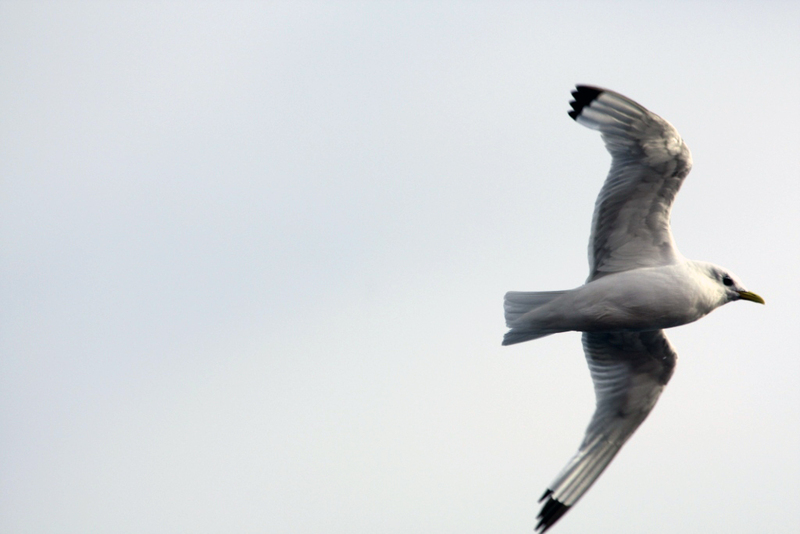 Many of these were defined by William Scoresby Jr., a whaling captain and eminent scientist. To make comparisons with current Arctic sea ice conditions, he is working to unlock the modern meaning of these earlier ice terms. To help do this, he is making ice observations using the historic descriptions in parallel with those of modern ice observers in our team from the National Ice Center. Matt’s research is part of the ARCdoc project (www.arcdoc.wordpress.com). 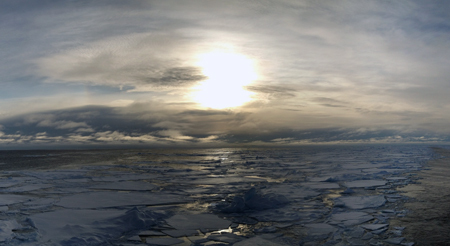 Matt Ayre observing sea ice. 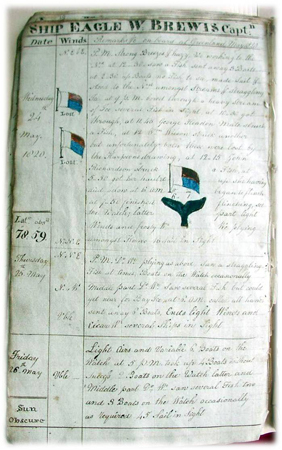 Page of an historic British whaling ship logbook recording ice and whales. Photo courtesy of Matthew Ayre, ARCdoc project. Today was a full day of north-south, lines up and down the northern slope of the Chukchi Plateau. 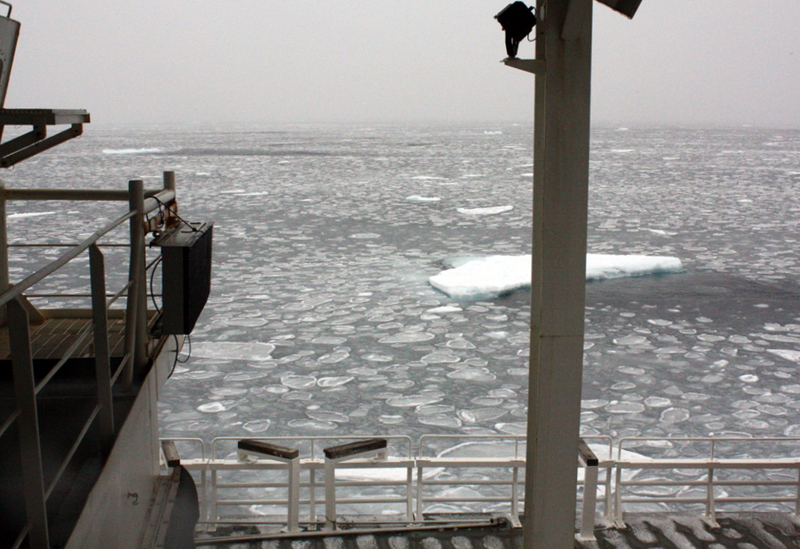 We traveled back into the marginal ice zone that we left yesterday. The temperature was in the 20s F, the sky was cloudy, the wind was blowing from the north to northeast at about 25 knots, and it snowed off and on throughout the day. The sky cleared somewhat this evening for a very pretty sunset. The sun is now below the horizon (but only by a little) for about 6 hours. 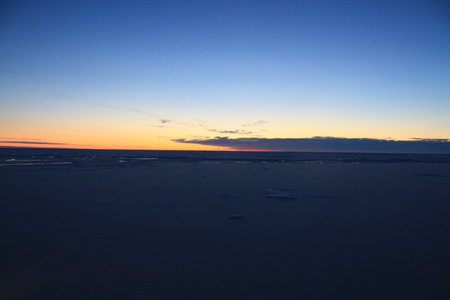 This evening we are traveling south again, headed back toward ice-free waters. With the wind blowing so steadily, we could experience some swells in the open water that will cause the ship to pitch and roll. We had become accustomed to the lack of seas (and lack of rolling) while in the ice. September 7 sunset. Photo by Bernard Coakley. Our mapping line today crossed a distinct rise on the northern slope of the Chukchi Plateau. This east-west trending feature is about 25 nautical miles long and 12 nautical miles wide and sits at 2650 meters of depth, about 250 meters above the general depth in the area. 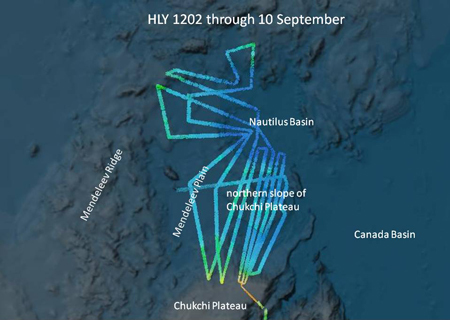 It had been mapped in 2004 with Healy’s previous multibeam echo sounder. 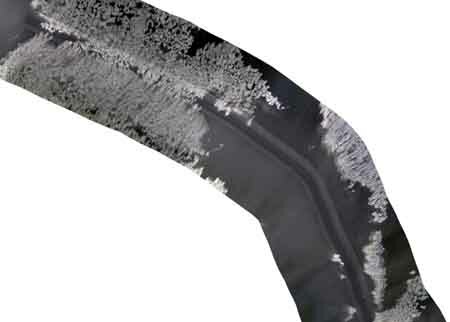 The presently installed multibeam provides significantly better resolution. The data from this year shows much more detail, and we discovered that the surface of the seabed is disturbed by numerous pockmarks. Up until now, we have only seen pockmarks on the flat top of the Plateau. Detail views from 2007 survey and 2012 surveys of area with pockmarks. Pockmarks are not resolved in 2007 data. We left the ice pack completely about mid-day today as we ran a profile toward the south, up the northern slope of Chukchi Plateau. There was no sign of ice by the time we reached 81° North latitude. While this was not a surprise, based on the ice coverage maps we get from the National Ice Center analysts in our science team, it is shocking to see entirely open water here. Before we left the ice completely, we went through an area strewn with turquoise blue chunks of old, thick, multiyear ice. 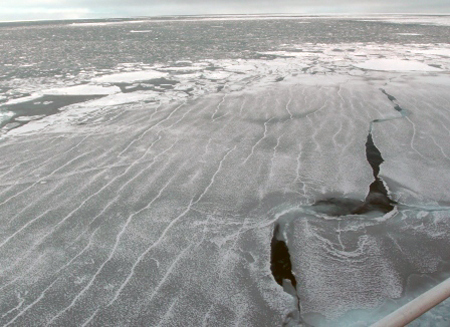 This large field of ice floes must be the result of a large multiyear floe that broke up at the edge of the pack. Broken pieces of old and thick ice near the edge of the ice pack. The lack of ice does allow Healy to steam faster, and we can acquire more and better multibeam depth data than we would in ice. We haven’t found any surprises in today’s surveying, but we are continuing to fill in and improve the Arctic seafloor maps. 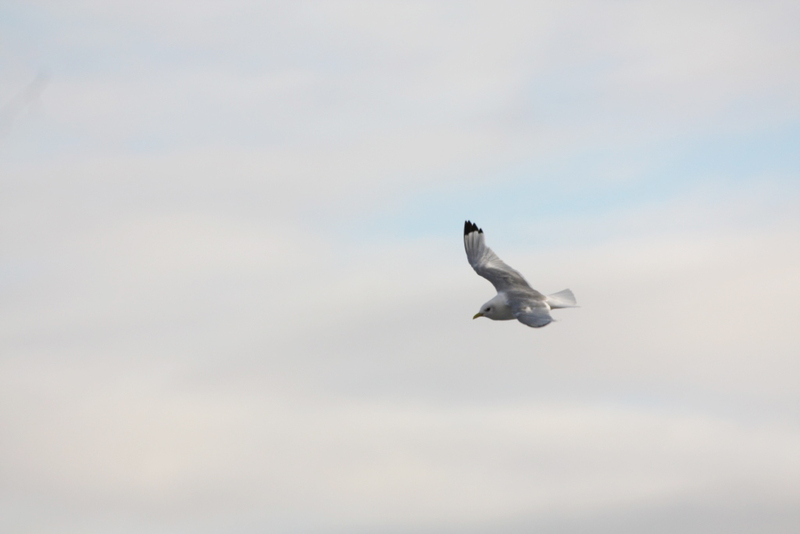 As we were passing through the thin ice at the edge of the pack, Healy was joined by several sea birds—the first we have seen since we left Barrow on this cruise. The birds were diving to the water behind the ship hoping to catch some of the small fish washed near the surface by the ship’s wake. 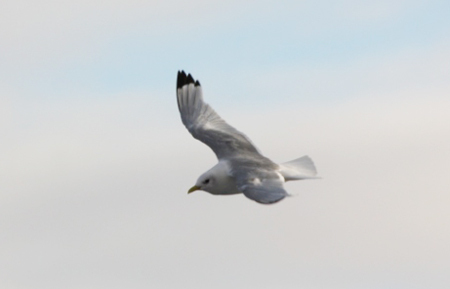 I’m guessing that the birds we saw were Kittiwakes, but if some sea bird experts have a more informed identification I’d like to hear from you. Yesterday, we had planned to put another ice buoy in the water, but our ice team discovered that the buoy’s data transmission system was malfunctioning. 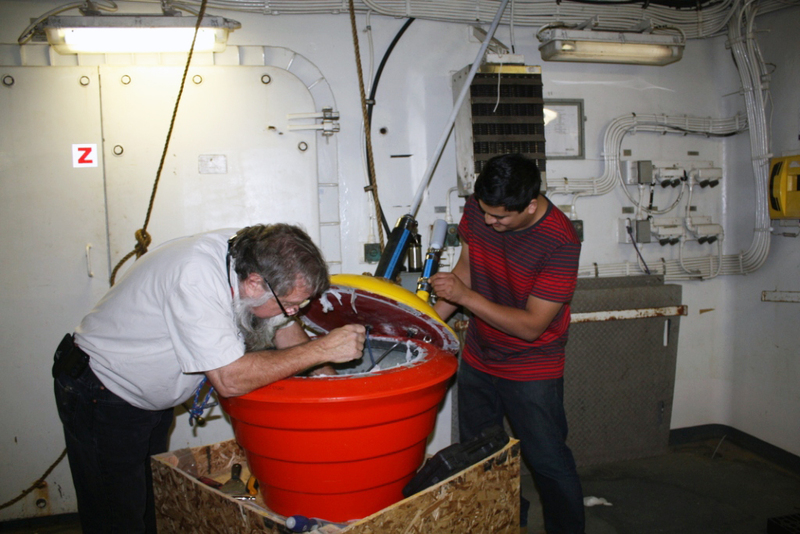 Our onboard science support engineers are troubleshooting the buoy in consultation with engineers ashore. 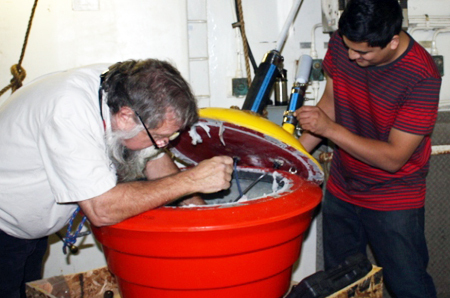 Our support engineer, Dale Chayes and MATE marine tech intern Joshua Reyes troubleshooting the balky ice buoy. Today we returned to the seafloor knoll that was partially sounded on August 31 to fully map the feature and determine if it rises above the 2500 m depth contour. (The 2500-m contour is a key element in establishing limits of the extended continental shelf.) Our multibeam mapping determined that the highest point of the knoll is about 2690 m deep and thus does not give us a 2500-m contour to work with. Nonetheless, we now have a detailed survey of the knoll to replace the vague shape on the existing maps. Seafloor knoll on elevated plateau west of Nautilus Basin. 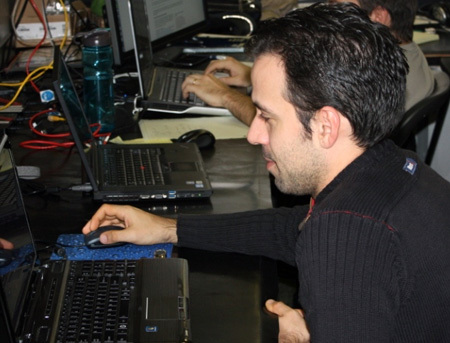 After we acquire the multibeam echo sounder data, our data processing watch team “processes” the data. In data processing, we confirm that the ship’s position and attitude data are valid and we clean erroneous depth values from the sounding data. These erroneous depth values can arise from interference from other echo sounders, bubbles or ice under the ship, mechanical noise from the ship’s machinery, or often just from weak echoes returning from the seafloor. The cleaned depth values are combined into a digital depth data grid for display and analysis. U.S. 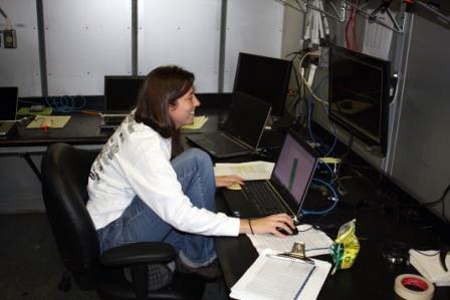 Naval Oceanographic Office surveyor Monica Price processing multibeam echo sounder data. This morning, we reached the northernmost point of our cruise, at latitude 83° 30.5' N, longitude 162° 07.3' W, on the southern side of the Alpha-Mendeleev Ridge. After reaching that point, we turned south to map another profile down to the Nautilus Basin. The seafloor is much more irregular on the Alpha-Mendeleev than the other areas we have mapped this year. While mapping, we generally have two of our team standing watch on the multibeam echo sounder and subbottom profiler data acquisition stations. The watch standers are responsible for ensuring that the systems are operating properly and that the necessary adjustments are made to the sonars as depth and bottom conditions vary. 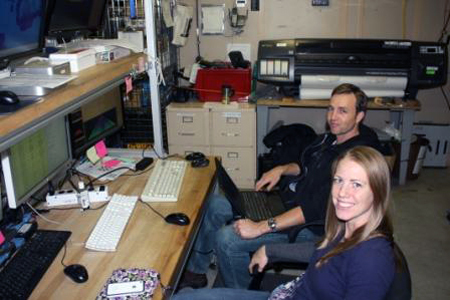 UNH graduate students Derek Sowers and Lindsay McKenna on watch. Shortly after turning south, we located a suitable opening in the ice and stopped in 2800-m of water to conduct a CTD cast. 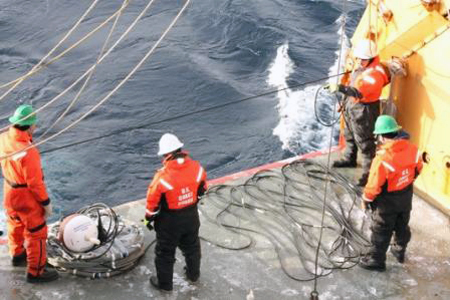 The instrument is lowered by wire, almost to the seafloor, and retrieved. 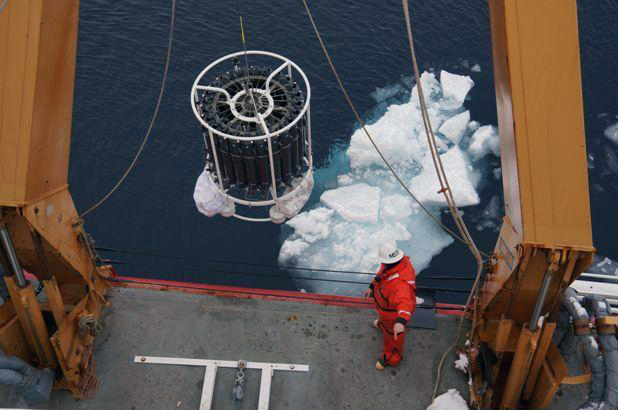 Conductivity, temperature, and depth are recorded on the way down and up, and the rosette is stopped periodically on the way down to capture water samples. The data from the CTD cast data will be used to prepare a profile of sound speed versus depth for correcting our multibeam echo sounder, and the data and water samples will be analyzed by the U.S. Geological Survey and University of South Florida chemical oceanographers of our team as part of their ocean acidification research project. Coast Guard Marine Science Technicians or members of our science party stand by throughout the cast to monitor the wire angle and fend away any ice that threatens to hit the wire. 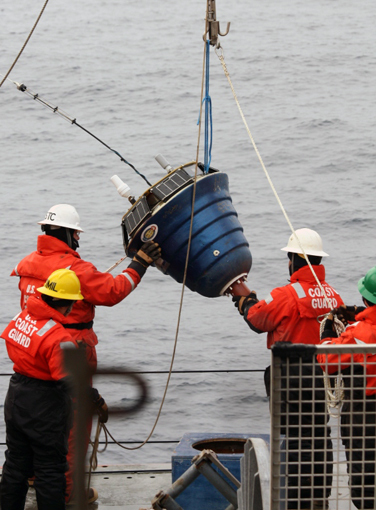 Coast Guard Marine Science Technician Chief Kirt Steward guiding the CTD rosette out of the water. Photo by John Farrell. Later in the day, we set a buoy on the ice that will observe and transmit position and weather observations ashore. This evening, after completing our southerly track, we will turn to the right for another profile onto the elevated plain west of the Nautilus Basin. We will get a look at the feature we discovered but did not develop on August 30th. Over the weekend, we have been busy collecting multibeam echo sounder and sub-bottom profiler data. We completed several long lines up the slope from the Nautilus Basin onto the Menedeleev Ridge and the Chukchi Plateau and back down the slope into the basin. Our goal for these lines has been to establish the character of the slope from the elevated plateaus down to the deeper ocean basin. With each line, we improve our knowledge of the Arctic seafloor morphology. We have found some hills rising over 300 meters from the seafloor that, were they on land, would be notable features. 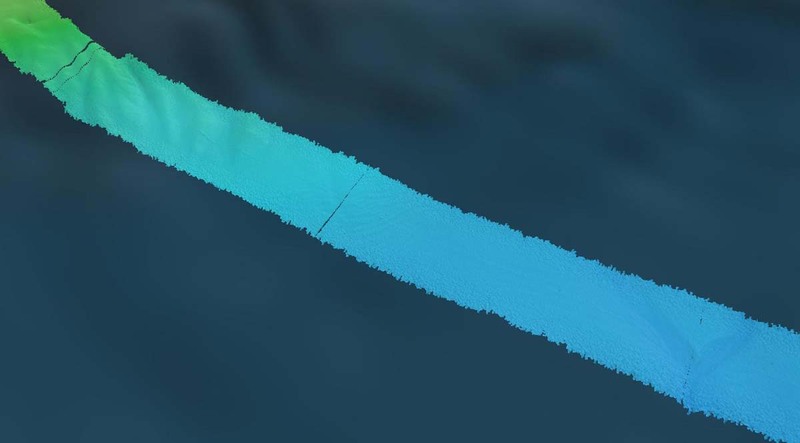 Our multibeam echo sounder mapping has also revealed some very fine seafloor detail, that until recently would have been beyond the ability of echo sounders to distinguish. For example, we can see erosional drainage patterns formed on the seafloor that are strikingly similar to those found on land. These patterns are likely the path of sediment flowing in channels down the slope into the ocean basin. 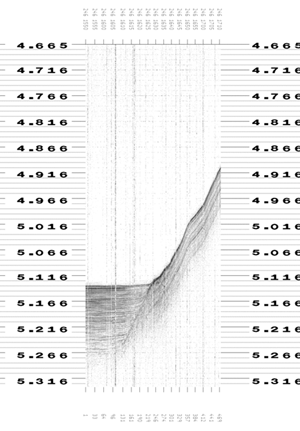 In some cases, instead of finding a new mountain on the seafloor, we discover that a feature on the chart does not exist. Today we went over an area showing a 500-meter rise in depth—there was nothing there; the seafloor was completely flat. High-resolution multibeam swaths over our existing map of the Arctic. The 300-m high hill, at the right, was completely unknown. As the multibeam echo sounder acquires a wide swath of high resolution depths, the sub-bottom profiler transmits lower-frequency sound pulses that penetrate the seafloor, revealing the subsurface structure as deep as 50 meters into the seabed. These subsurface records help us interpret the geology of the area and distinguish between distinct regions of the seafloor. They will contribute significantly to the U.S. effort to establish the limits of our extended continental shelf. Bifurcating drainage pattern on the northern slope of the Chukchi Plateau. 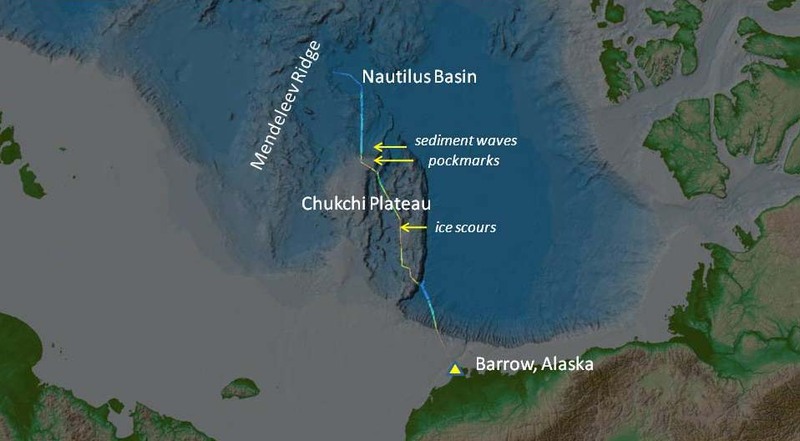 Sub-bottom profile record crossing from Nautilus Basin onto the slope of Chukchi Plateau. The flat-lying sediments of the basin abut against, or “on-lap” the sloping sediments leading down from the plateau.ifurcating drainage pattern on the northern slope of the Chukchi Plateau. 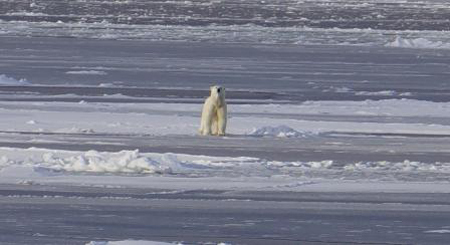 Just after midnight on Monday morning, the bridge watch saw a polar bear about a mile from the ship. The photos at this range were a little fuzzy. 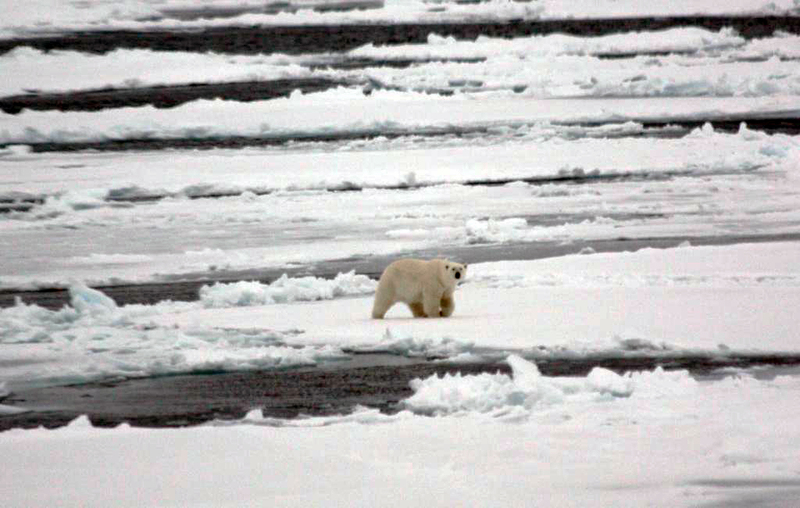 This was the first polar bear sighting of the cruise, but we hope there will be some more sightings when more of us are awake. 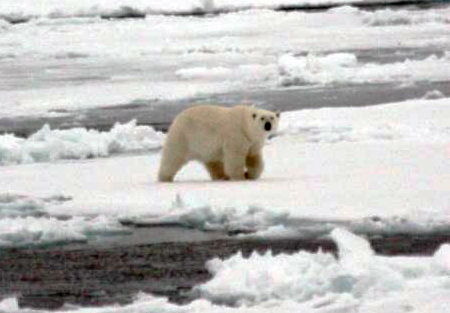 Polar bear on the ice; September 3. Photo by Roland Arsenault. Last night we discovered some interesting and striking submarine features in the area west of Nautilus Basin. 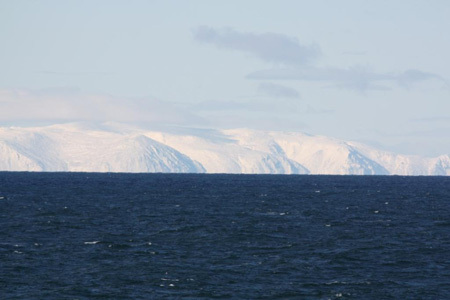 The peaks we found rise about 250 meters above the surrounding seabed. These discoveries highlight the fact that we know very little about the Arctic seafloor. Most of the time we are surveying with our multibeam echo sounder we are mapping ocean floor that has never been seen before. Cluster of peaks on the seafloor. Healy’s fantail with light snow cover. Aloft Con photo from 1:00 pm local time. During the morning our track brought us eastward into the Nautilus Basin. We crossed a distinct change in slope and change in character of the seafloor when we crossed into Nautilus Basin. On the Mendeleev Plain, where we had been, the seafloor is somewhat irregular and slopes toward the basin. In the basin, the seafloor is absolutely flat. After traveling about 25 nautical miles into the basin, we turned to the southwest to run another profile back up the slope across another section of the Mendeleev Plain. We saw the distinct change in seafloor again as we crossed out of the basin. As we traveled south, the ice pack thinned out considerably. 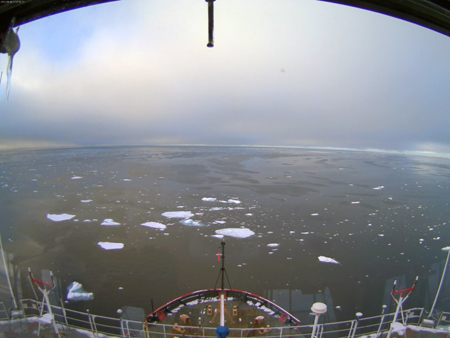 The day began with deployment of a seasonal ice buoy from the stern of the Healy. This buoy can be deployed either in the water or on the ice. We deployed it in open water within the ice pack, but it is designed to remain in operation when new sea ice forms later this year. 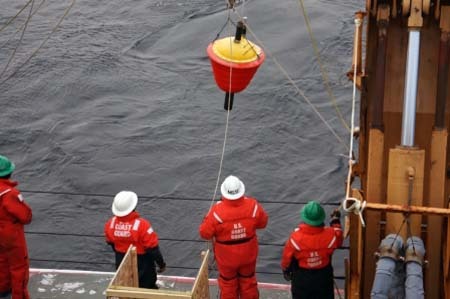 The buoy will periodically measure and transmit its position, air and water temperature, and barometric pressure to the University of Washington Polar Science Center for quality control and use by the National Weather Service, the National Ice Center, and other specialized users. The buoy will contribute critical data to the national numerical weather prediction models. 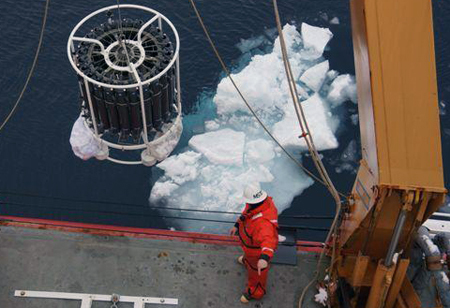 With so few weather observation points in the high arctic, this buoy will have a significant impact. Deploying the seasonal ice buoy. Photo by John Farrell. We are continuing on our up- and down-slope mapping lines, gathering bathymetric profiles that will ultimately help the U.S. establish the limits of our extended continental shelf. Early this morning, we passed by the edge of a large seafloor feature that appears on existing maps, but may rise higher off the seafloor than previously suspected. We didn’t have time today to develop this feature, but we may be able to return there later in the cruise to map in more detail. 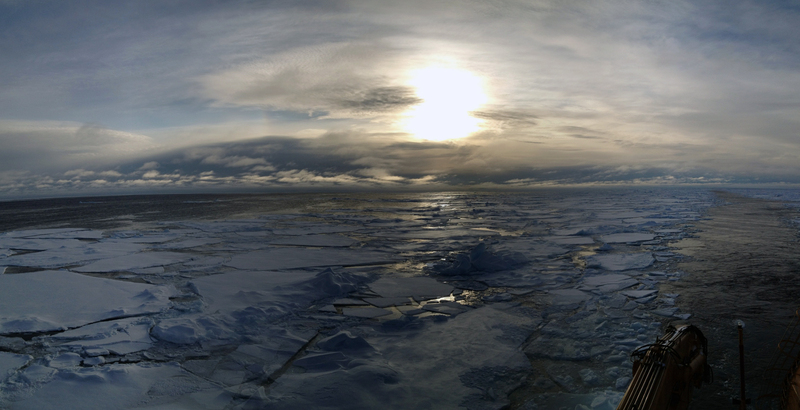 We completed our transit to the northern part of the Chukchi Plateau this morning, and crossed into the Nautilus Basin. 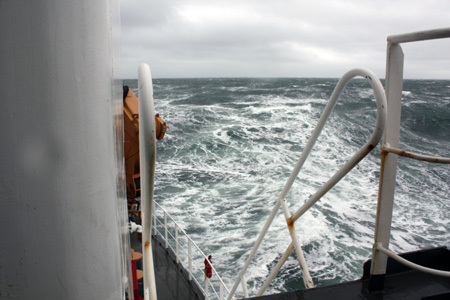 Once in the basin, 650 nautical miles north of Barrow, we turned westward to map up onto the Mendeleev Ridge. Throughout the day, we have been traveling through the marginal ice zone, the area where broken pieces of sea ice are separating from the main ice pack. 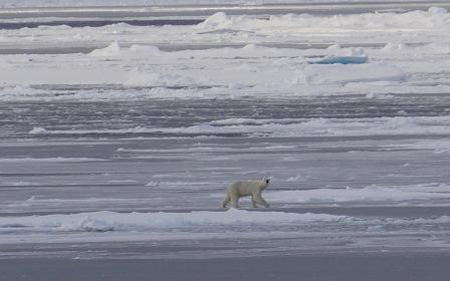 The main part of the ice pack is north of us; the National Snow and Ice Center has reported that the Arctic ice cover is the lowest ever recorded, surpassing the previous record set in 2007. The ice cover is expected to continue to shrink for another two weeks or so before it starts to rebuild for the winter. The ice along our track today. 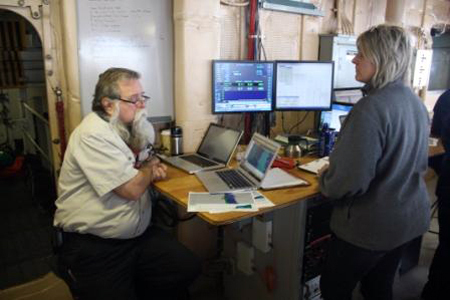 The primary goal for this cruise is to collect seafloor mapping data that will help the U.S. define the limits of our continental shelf beyond 200 nautical miles from the coastline. The Convention on the Law of the Sea sets out the criteria for defining this “extended continental shelf,” and although the U.S. has not yet acceded to the convention, we are doing the seafloor mapping necessary to establish our limits. While this is the primary goal of our cruise, we are also collecting data that greatly improves our understanding of the Arctic Ocean and our knowledge of the seafloor. Although we have a general idea of the depths in the Arctic, only about 10% of the Arctic seafloor is mapped in detail. 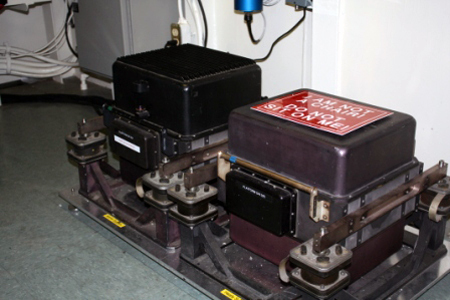 The multibeam echo sounder that is installed on Healy collects accurate and high-resolution depths across a wide swath of the seafloor. 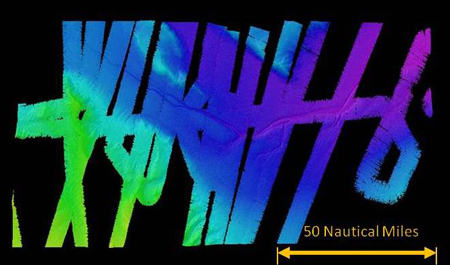 As the ship travels along, the multibeam maps a swath equal in width to about 3.5 times the depth, so in 2000 meters of water, we map a 7000-m wide swath. 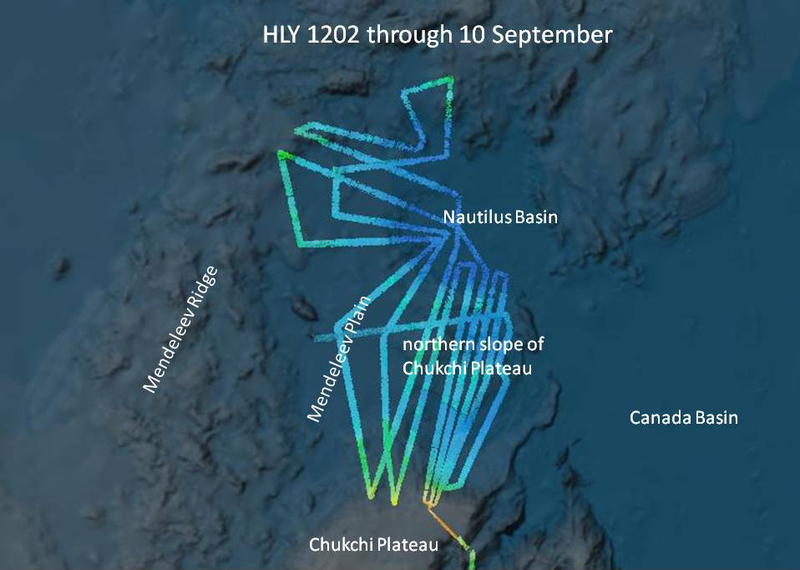 Our first swaths have mapped several very interesting seafloor features. As we crossed the Chukchi Plateau, we discovered patches of seafloor that were scoured by massive blocks of ice, pockmarks on the seafloor caused by the release of fluids or gas, and waves of sediment arrayed down the side of an undersea slope. Scour marks on the seafloor. Sediment waves on the slope; large features at the left, finer waves in the center, a bifurcated channel at the right. 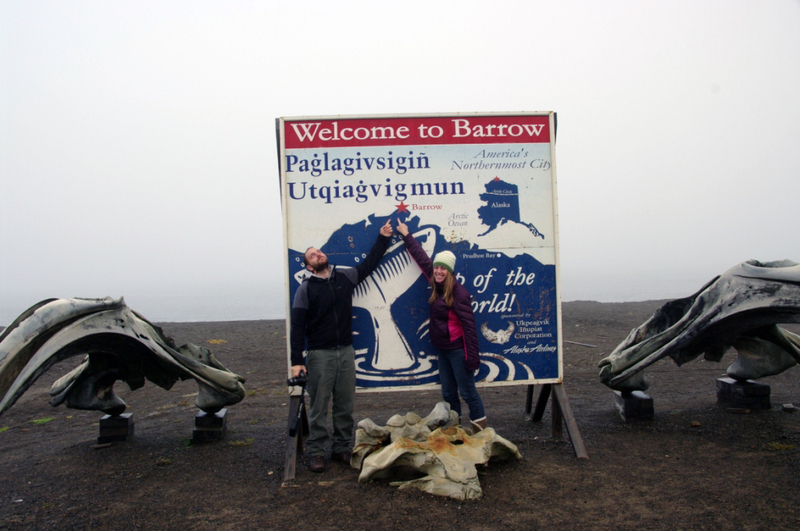 Most of the science party for our cruise arrived in Barrow, Alaska on August 23. 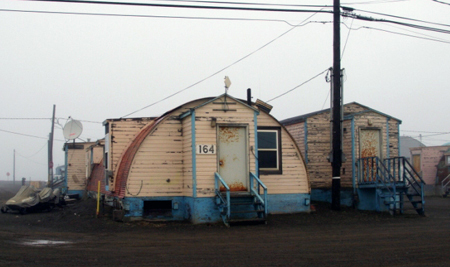 Barrow, on the northern coast of Alaska, is the northernmost city in the United States. For some of us, it was a long day of riding a 737 all over Alaska. We started with a 6 am departure from Anchorage where it was rainy and overcast. Our flight stopped in Fairbanks where it was sunny and clear. We were held up in Fairbanks, however, because our next stop, Prudhoe Bay, was fogged in, as was Barrow. After a couple hours, we returned to Anchorage in the hope that a later flight could land in Barrow. Catching the later flight, we took off from Anchorage and flew to Prudhoe Bay with a large group of workers heading for their rotation in the oil fields. From Prudhoe, we flew west along the north coast of Alaska toward Barrow. The sky was clear over the land but the shoreline and the Beaufort Sea were completely covered by low clouds and fog. Luckily, the clouds and fog ended abruptly at Barrow Point, and we were able to land at the Barrow airport. 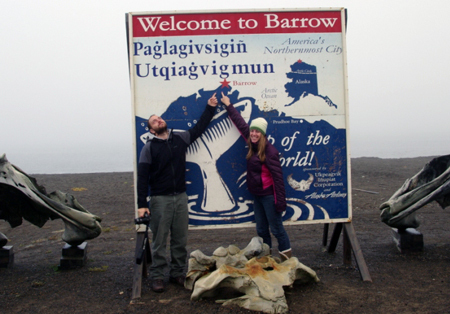 CCOM grad students Kevin Jerram and Lindsay McKenna at the northernmost city sign on the beach at Barrow. Photo by Glen Rice. Hotel space in Barrow was limited, and the hotels there could not accommodate our large group. 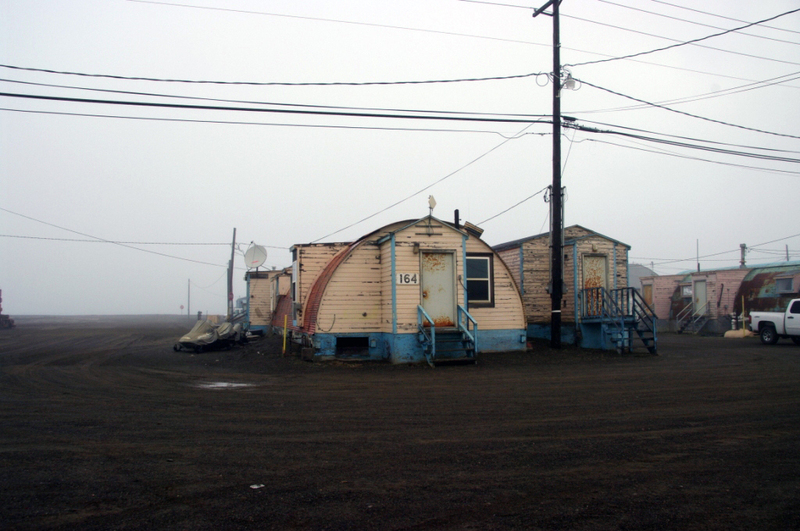 We stayed at some refurbished Quonset huts at NARL, home of a government Arctic research support facility and the North Slope Borough’s Ilisagvik College. One of the NARL Huts where we stayed in Barrow. Photo by Glen Rice. 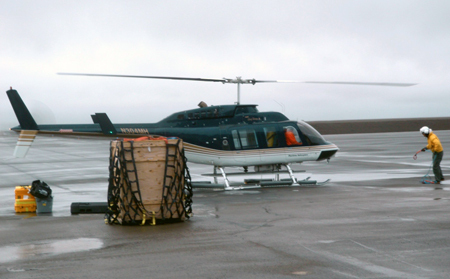 The rest of the science team arrived on August 24, and on August 25 we began a helicopter transfer to Healy. In addition to the people and their luggage, the helicopter took several pallets of groceries and oceanographic equipment to the ship. When the helicopter flying visibility closed in at 10 pm, there was still a large amount of gear and two of us left on shore. We completed the transfer on the 26th, and the ship weighed anchor and got underway. 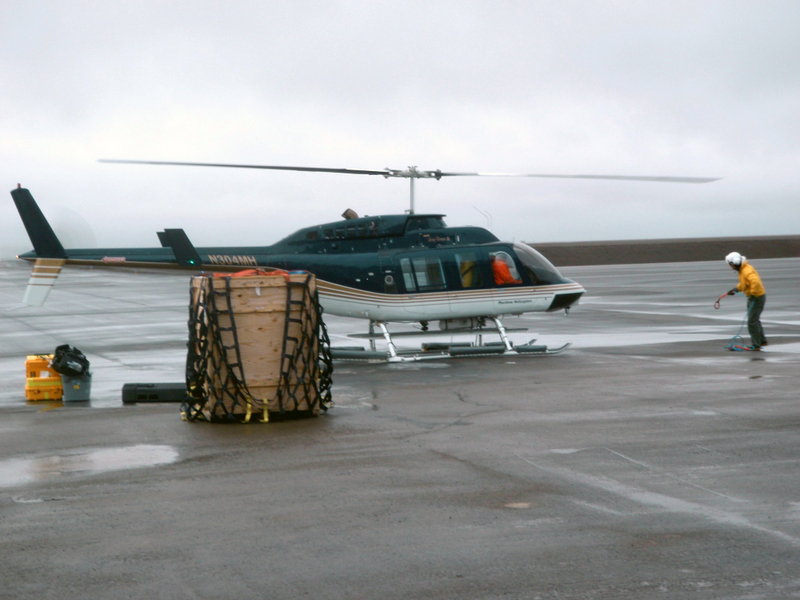 The helicopter that shuttled us to Healy, preparing to sling a crate of oceanographic equipment. After reaching deep water on the morning of August 27, we stopped for a Conductivity-Temperature-Depth (CTD) cast and a “patch test” that we used to calibrate our multibeam echo sounder. 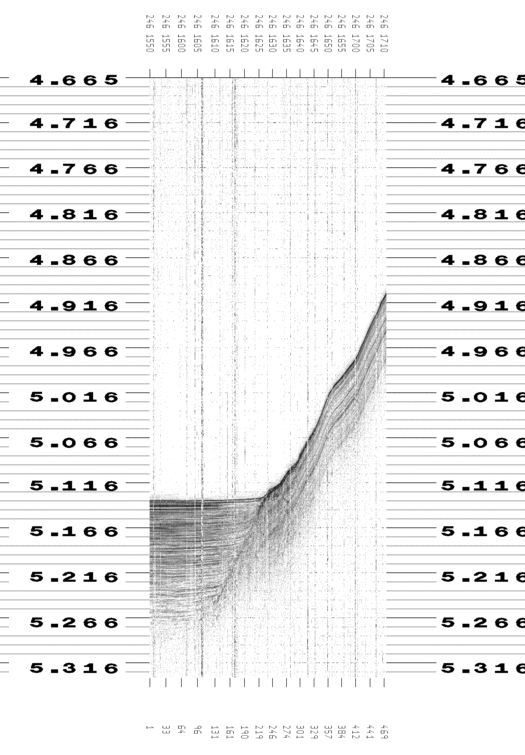 The CTD profile allows us to create a depth vs. sound speed profile. By knowing the speed of sound throughout the water column, we can correct our depth soundings for the effects of speed changes and refraction along the path our sound pulses travel from the ship’s transducer to the seafloor, and back. The patch test is a set of reciprocal and parallel echo sounder swaths that confirm our multibeam system is operating consistently. Launching the CTD. Attached to the CTD is a bag of Styrofoam cups decorated by the crew. The cups will shrink to thimble size as the CTD is lowered 3800 meters deep. After the CTD and the patch test, we began a long depth-sounding transit to the northern end of the Chukchi Plateau. The Chukchi Plateau is a large area of continental shelf that extends several hundred miles north of the coast of Alaska. We have been continuing on that transit line throughout the day today. Healy’s track north across the Chukchi Plateau.